Hey there. With school starting up soon (if it hasn't already for some of you! ), it's hard to believe we're still in the midst of summer. 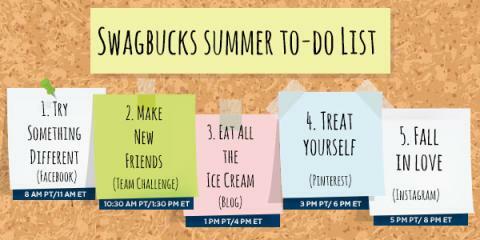 Well, Swagbucks is here to help us savor the season with a little fun -- and a lot of Swag Bucks! The Save the Summer Swag Code Extravaganza is ONE DAY ONLY! On Wednesday, Aug 13, this Swag Code Extravaganza starts at 8am PT and will run until 6pm PT (11am ET - 9pm ET). With the Save the Summer Swag Code Extravaganza, you can earn up to 25 SB in just Swag Codes alone -- plus, if you're part of the Dog Days of Summer Team Challenge, these codes all count towards points for your team. It's a win-win that will help you get more SB so you can get your next gift card sooner -- who wouldn't want that this summer? If you haven't joined Swagbucks yet, I'm telling you from my own experience that you're missing out. With hundreds of gift cards available, Swagbucks.com can help you get a little extra money for holiday shopping, presents for friends and family, those random Amazon purchases ... even your guilty-pleasure Starbucks routine! I have been able to fund more than a few giveaways from the giftcards that I have earned at Swagbucks! Don't waste any more time, and sign up here. Later!